An Owl Farm opens in Brooklyn. Photo courtesy of Here’s Park Slope. On Episode #132 (listen here) of Beer Sessions Radio™, host Jimmy Carbone—himself a bar owner (Jimmy’s No. 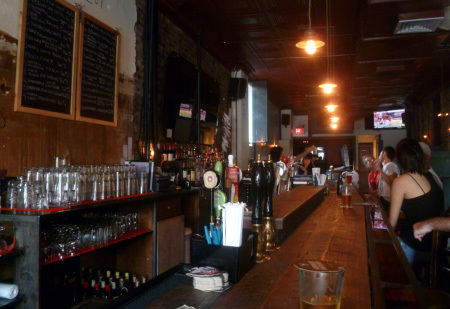 43) hosts a lively conversation on what it takes to run a bar in NYC and beyond. Triple bar owners (and brothers) Ben and Seth Wiley (Mission Dolores, Bar Great Harry, and their newest venture, The Owl Farm) join Carolyn Pincus (The Stag’s Head), Kirk Struble (Fourth Avenue Pub, Washington Commons) and Marcus Burnett & Ethan Long of Rockaway Brewing Company. Certainly the number of craft beer bars and the number of craft brewers has created a “local revolution” of sorts. Whereas a few years ago, the West Coast breweries really were the only game, now there are many great East Coast breweries, although differences remain between attitudes (west = pretty chill; east = breaking a sweat to make great beer) and styles. The great group of bar owners and brewers on this episode talk “cool ship,” collaborative brewing and weird beers. Listen in or download at iTunes. Previous post ← What’s For Breakfast (Stout)? We Got Founders In Da House!